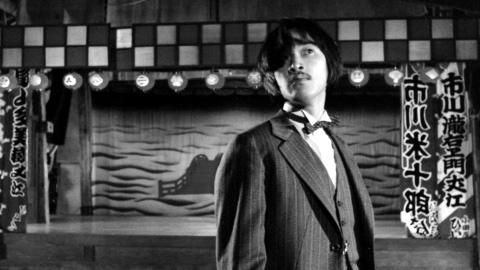 No longer compromised by the demands of working at a major studio, Seijun Suzuki’s Taisho Era trilogy of Zigeunerweisen, Heat Haze Theatre and Yumeji are seen as his mightiest works in Japan, yet they remain virtually unacknowledged in the West, overshadowed by the equally capricious yet more commercially-minded movies he made for Nikkatsu in the 1960s such as Youth of the Beast and Branded to Kill. Produced during the 1980s by Genjiro Arato’s company Cinema Placet, these hypnotic, super-stylised meditations on the blurred boundaries behind the ostensible and the unreal are the kind of films that will take many viewings for the viewer to grasp their meaning on every level. Set in Tokyo in 1926, three years after Suzuki’s own birth, Heat Haze Theatre depicts a Japan caught in flux between tradition and modernity, with 1970s action star Matsuda playing Shunko Matsuzaki, a playwright of modern Shinpa theatre who is being supported by a wealthy patron, Tamawaki (Nakamura). One day he crosses the path of a beautiful woman on her way to the hospital where she tells him a friend is dying. She asks Matsuzaki to accompany her because she is scared of a mysterious older woman (Azuma) there who is selling the fruit of the Chinese Lantern Plant, or physalis, rumoured to contain the souls of women. He refuses, but finds himself unable to shake off this beautiful apparition, whom it is later revealed may be the deceased wife of Tamawaki. But the mystery deepens when it is revealed that Tamawaki actually had two wives, one a blonde and blue-eyed European whom he married during a stay in Germany and attempted to change into a traditional Japanese bride by forcing her to wear dark lenses and dye her hair black. Matsuzaki follows the trail of messages left by his phantasmal enchantress across the country to Kanazawa, but when he bumps into his benefactor on the train, who tells him that he is going to witness a love suicide, he realises that he is being lured to his death. 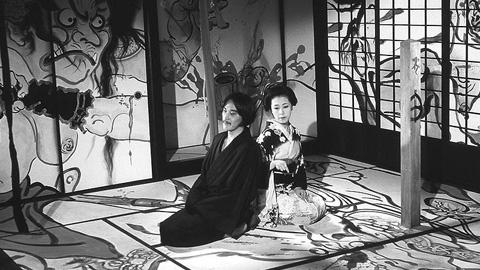 Heat Haze Theatre is based on a story by Kyoka Izumi (1873-1939), whose lyrical but ambiguous writing formed the basis of a number of silver screen adaptations, ranging from Kenji Mizoguchi’s early silent The Water Magician (Taki no Shiraitô, 1933) to Teinosuke Kinugasa’s Midare-gami (1961) and Masahiro Shinoda’s Demon Pond (Yashagaike, 1979). 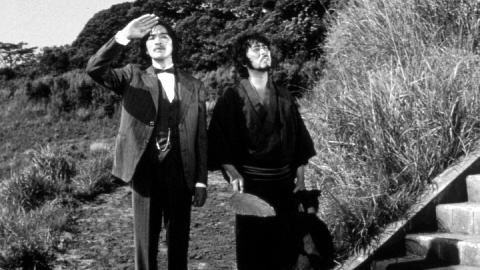 His work, connected with the worlds of Kabuki and Noh theatre and often containing fantastical and supernatural elements, seems naturally suited to Suzuki, for whom the screen offers only a tenuous link with reality. Suzuki sumptuously recreates the period through costume and set design, with the film culminating in an electrifying Kabuki-styled coda. With its dreamlike continuity, disorienting edits (characters often seem to pop in and out of shots at whim) and a haunting soundtrack from Kaname Kawachi (who scored all Suzuki’s Taisho trilogy films), this is cinema at its most inventive and bizarre, and one of the best of its decade.